The cabinets in your home need to be the perfect combination of functional and beautiful. On the surface they have to add value to the space they’re in by complementing it; underneath, they need to house whatever you put in them with great versatility. At Kleins Cabinet and Countertops, we believe there’s no such thing as the perfect stock cabinet. That’s why we only offer custom cabinetry in Oroville, CA, designed and produced to meet exact customer specifications. When you choose us for cabinetry, you can be sure you’re getting a tailor-made solution that’s unlike anything you’d find off-the-shelf. 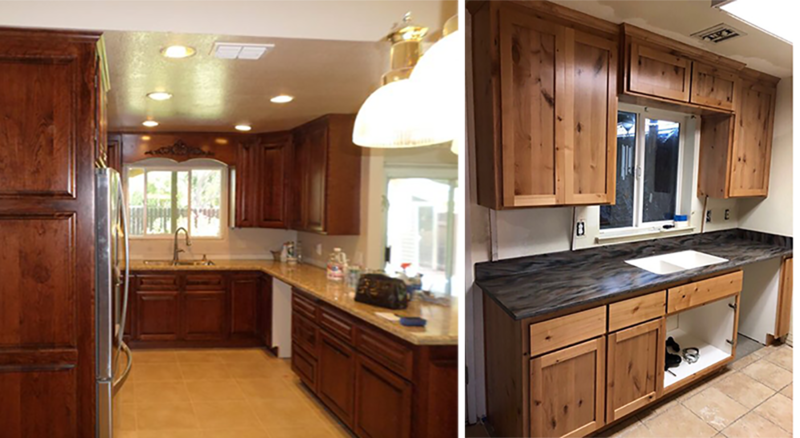 We have design and millwork capabilities that surpass any other kitchen cabinet shop in Oroville, CA. Our team works with you to determine the scope of your kitchen cabinet needs, mocking up 3D designs that allow you to see them before they’re made. No matter the number, size or style of cabinets you need for your kitchen, we’re prepared to deliver them. Bathrooms require customized cabinet solutions that can vary greatly in size and style. Our team will get to know your bathroom’s dimensions and style in order to produce cabinetry that’s complementary and versatile, designed especially for your home. Need multipurpose cabinets for your garage, basement, laundry area, office or other room of your home? Consult with us and we’ll be happy to provide you with ideas and design inspirations that result in beautiful, functional cabinets. For closet interiors and crawlspaces, come to us for custom-built organizers. No matter the size or the design specifications, our organizers will help you compartmentalize your life. Our woodworking abilities also extend to custom shelving. Our goal is always to provide you with shelving that’s beautiful, versatile and resilient, so you can use it to its fullest effect in your home. To discuss your needs for custom cabinetry or for additional information about our wood varieties, design capabilities, pricing or turnaround times, please contact Kleins Cabinet and Countertops today at 530-533-6310.